A cultivar of Camellia japonica L., it has a spreading habit with large, semi-double to anemone-form, bright red flowers with an occasional white blotch. [Hilliers’]. ‘Bud large, pointed-oval, with scales part blackish and part yellowish; flower four inches in diameter, rose-form, double, depressed, of a superb deep orange-red, No.8; petals of the circumference mucronated, imbricated, rounded, regularly arranged, crenated, those of the centre smaller, erect, elongate, folded a little in a cornet form, sometimes spotted with white.-Magnificent.’ [Berlèse Monography p.84/1838]. Flowers on an individual tree may vary from all red to all white, with forms in between. ‘[Chandler’s new Camellia] was raised from seeds procured by impregnating the pistillum of the anemony-flowered variety with the pollen of the striped red, by Messrs. Chandler and Buckingham, at their nursery, Vauxhall.’ [BM t.2571/1825]. ‘An elegant variety, raised from seeds by Mr. Chandler, in 1819. It is a free flowering sort, and the flowers vary a good deal in the proportion of white, some having very little, others more, and some quite plain red.’ [LBC no.1897/1834]. MB p.73/1835. Listed in the 1850 and 1857 catalogues [T.207/1850]. Desideratum to Loddiges’ Nursery, 6th January 1845. This is the probable source. [MP A2933-2, p.28]. Chandleri is listed in both the 1830 and 1836 editions of Loddiges’ Nursery catalogue, copies of which are held at Camden Park [CPA]. In the 1836 edition it is marked with a ‘+’ the meaning of which is unclear. ‘Chandleri’ was found at Camden Park in the 1930s by Walter Hazlewood and propagated by him. At the time it was thought to be the last remaining specimen in the world. [Camellias in Australia. Southern Californian Camellia Society Review, Oct. 1952]. There are a number of mature plants of ‘Chandleri’ in the Southern Highlands of New South Wales, reputed to have originated at Camden Park. 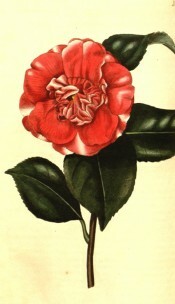 According to Hazlewood his article in the Southern Californian Camellia Society Review was erroneously attributed to J. R. L. Calder of Victoria. There is a copy of the article, probably typed by Hazlewood and containing this note, in the Mitchell Library, Sydney.